Lucas (Elijah Rodriguez) works for MS-13, which is one of the biggest gangs in Washington, D.C. When ruthless drug lord Rincon (David Castañeda) recruits Lucas' 10-year-old brother Miguel (Nicholas Sean Johnny) to work as a runner, Lucas is desperate to keep Miguel safe. 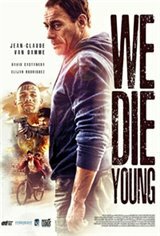 Fleeing for their lives, the boys are rescued by a veteran with PTSD named Daniel (Jean-Claude Van Damme), who helps them find their revenge.